Klang Valley's F&B biz is one of the toughest so it is indeed a cause for much celebration when New Formosa Restaurant in SS2, PJ reached its 35th anniversary milestone recently. The owners - chef Lee Weng Eng and his Taiwanese wife, Mrs Jeanie Lee - have established New Formosa Restaurant as one of PJ's bastions of Chinese cuisine; their signature Taiwanese specialities have kept diners returning throughout the years. While her husband cooks up a storm in the kitchen, Mrs Jeanie Lee holds court as the restaurant's consummate PR; an extremely generous and hospitable host who ensures everyone eats their fill and would send food reviewers and bloggers on their merry way home with extra portions of food to boot! 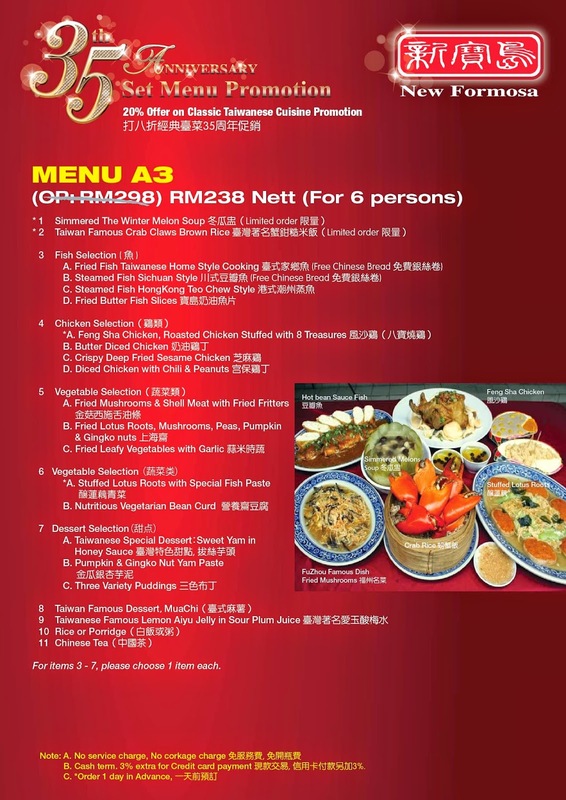 In conjunction with New Formosa's 35th Anniversary, the enterprising lady has created special *set menus priced at RM188 and RM238 for 6 persons, for tables of 10 persons RM498 and RM668. Some of its famed signature dishes that have cemented New Formosa's long-standing reputation were served for preview; giving us a taste of its success secrets. For me, the show-stopping dish is Feng Sha Chicken (roasted chicken stuffed with eight treasures). It's hard to say which part I enjoy more: the crispy skin, the juicy meat or the incredibly delicious stuffing of brown rice, mushroom, onion, minced pork, sausage, dried shrimps, chestnuts and shallots. Coming in a close second is the Taiwanese-style Steamed Crab with Brown Rice. According to Mrs Lee, this traditional treat is stuffed with glutinous rice but Chef Lee has given a healthy twist by using unpolished brown rice which is easily digestible instead. Boosting the flavour profile further are black mushroom, Chinese sausage, dried shrimp, chestnuts and onion. The rice is so good that I'd be happy to fill up on that and leave the huge, meaty crab claws for die-hard crab fans. Having said that, the chunks of sweet crab meat are really moreish when dipped into the zesty ginger and vinegar sauce that is served with it. 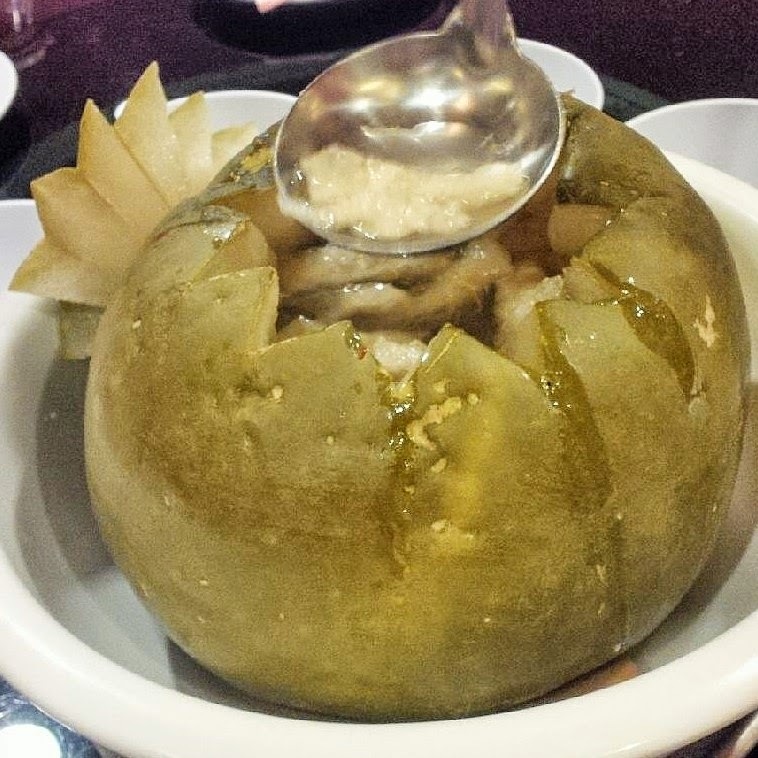 Soup lovers would be bowled over by the Simmered Winter Melon - an impressive offering of refreshing and nutritious winter melon soup that has been simmered for over 4 hours in a whole winter melon. Prepared with diced chicken, fish maw, mushroom, ginkgo nuts and dried baby scallops, the broth's clear, delicate sweetness is heartwarming and comforting especially for those who yearn for mom's cooking. More robust accents emerge from the Steamed Fish Sichuan Style in which a whole seabass is steamed to perfection. Soused in an appetisingly tangy and spicy sauce, the fish's natural sweetness was evident. We also had a field day mopping up the piquant sauce with pieces of fried man tou. Lighter dishes from the set menu include Fried Mushrooms and Shell Meat with Fried Fritters and Stuffed Lotus Root with Special Fish Paste. The simple mixture of wood ear fungus, enoki, ginkgo nuts and carrot sauteed with local la la clams and chopped yau char kwai (Chinese crullers) in a unctuous clear sauce makes for a nice contrast from the slew of indulgent offerings. 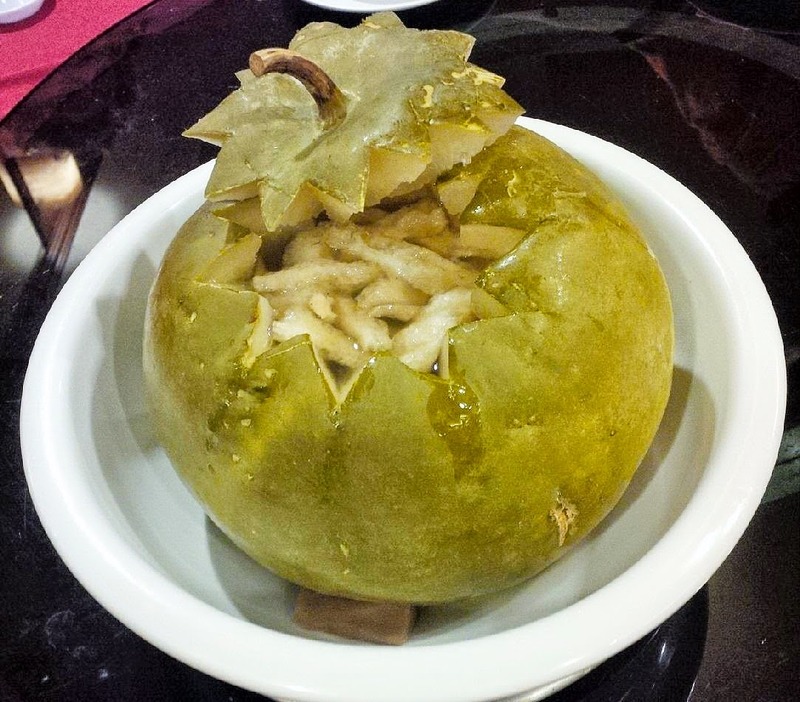 Another delightful creation is crunchy lotus root which comes stuffed with special housemade fish paste that reminds me of otak-otak. Complemented by chunks of board mustard stalks, straw mushroom and enoki in a thick, clear sauce, it also got two thumbs up from us. Mrs Lee also persuaded us to try New Formosa's Crispy Deep Fried Sesame Chicken - an irresistible speciality that goes well with beer drinkers. After one bite, we too were sold! Coated in crunchy, golden sesame seed-flecked batter, the pieces of chicken was polished off within seconds. Dessert options are aplenty here and again we had the chance to sample the mainstays which Taiwan are known for: Handmade Mua Chi, Lemon Aiyu Jelly in Sour Plum Juice, and Yam in Honey Sauce. Those little nuggets of glutinous rice balls covered in crushed peanuts are pretty addictive so find some restraint if you plan to sample the other treats. The refreshing lemon aiyu jelly (a gelatinous citrusy dessert made from the seeds of a fig-like fruit) with tapioca ‘pearls’ in sour plum juice is a godsend for our sweltering weather. But it has to be the yam in honey sauce that gets my vote. Imagine piping hot pieces of powdery yam coated in melted, caramelized sugar and sesame seeds then plunged into ice water to cool the sugar coating. The combination of powdery softness of steaming hot yam against the hard and crackly, cold and nutty honeyed shell is unbeatable. "The Teochew side of my husband's family is represented by Pumpkin and Ginkgo Nut Yam Paste" says Mrs Lee proudly. It's a labourious dessert to make but heavenly to eat as the rich yam paste is balanced by the pumpkin while the ginkgo lends some textural contrast. *It is advisable to call ahead and reserve the special menu as everything is prepared fresh to order. 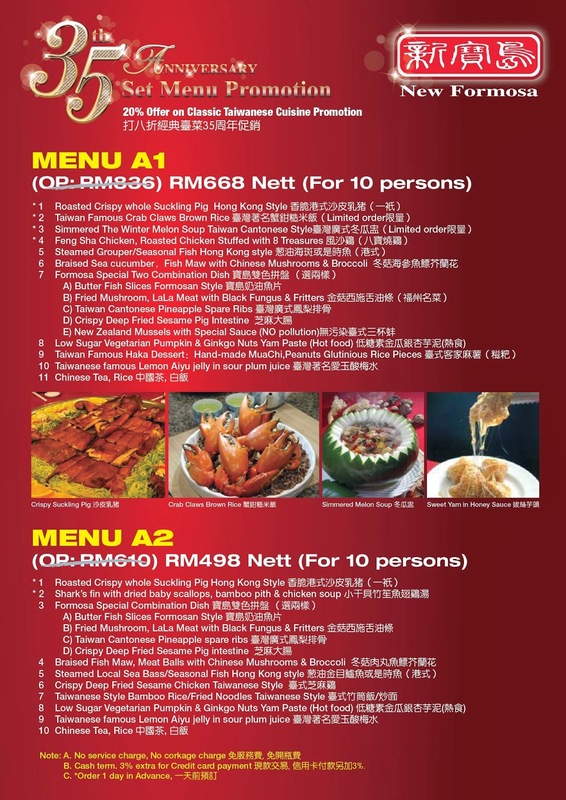 Menu prices based on cash term basis. For more information and reservations, call 03 7875 7478. New Formosa address: 46, Jalan SS2/24, Petaling Jaya, Selangor.